501 (c) (3). German Shepherd Dog rescue located in Roseville, Minn., founded by Lisa Veit, Randy Lenz, a retired K-9 officer, and Tressa Hinrichs. Rescues are housed by 10 to 12 active foster families in the area. The group relies on volunteers and donations for support. Saving Shepherds of MN is grounded in love, dedication, and determination in the rescue of German Shepherds and Shepherd mixes. 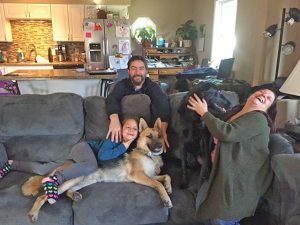 They are committed to “fully vetting” dogs before adoption. A large portion of donations go directly to veterinary care, and the group works to find helpful avenues for any behavioral challenges a dog may have. Volunteers are needed to transport animals to foster homes. There is also a need for more foster families; applications are available online. In 2016, 117 dogs were adopted, and in 2017, 142 were adopted. In September, the group hosts an annual Rally for Rescue at Hansen Kennels in Scandia, Minn. It is their largest fundraising event and includes social time for dogs and their owners to get to know each other, demonstrations in agility and search and rescue, silent auction and food. Periodically, the group will organize a fundraising event, such as a grocery bagging day at Cub Foods, to raise money for an individual dog that needs extensive and costly veterinary care. The organization’s website offers a variety of ways to support their work. Donations are welcome via PayPal and Amazon Smile, to help with the costs of food and veterinary care. There is also an option to sponsor a specific dog. TWO ALUMS. Behr, 7, and Bailey, 2, are Shepherds owned by Cate Kautz, of the Twin Cities. “We got Bailey as a pup when Saving Shepherds rescued a litter,” she said. Holly Galbus is a freelance writer based in Rochester. This entry was posted in Articles on June 6, 2018 by wpadmin.